It is an interesting situation: a black cop infiltrates the Ku Klux Klan, the most storied white supremacist group in the United States. How could this new undercover officer resist the temptation? How could he get past the one main obstacle: his blackness? It is an interesting plot: a white cop playing a black cop, two people posing as one voice and one personality, but one black and one white. How could a filmmaker resist the temptation? How could he get past the one main obstacle: that the Klan was a tired old group in the early 1970s and an anemic antagonist. The book, Black Klansman: A Memoir by Ron Stallworth, is interesting – but is the movie? Fortunately for us, some folks who know how to make a movie got the rights to Stallworth’s book and permission to take liberties. Using a few incidents from Stallworth’s memoir and adding movie-type action suspense, they put together a script that just had to find Spike Lee. 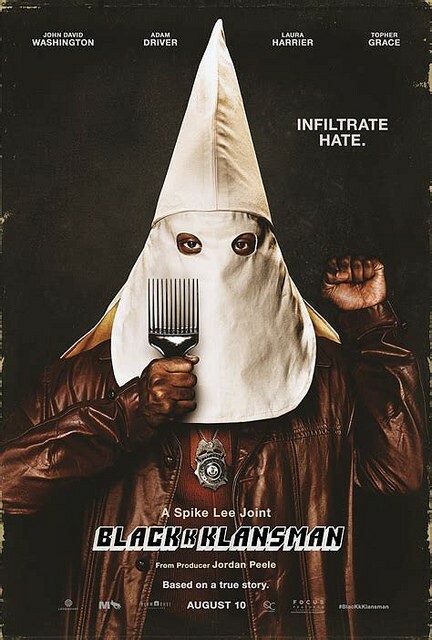 This was a strong foundation of a team that brought us a magnificent film, one that might not be an accurate depiction of the Klan in the early 1970s, but one that is an insightful representation of Americans and our worst frailties. The script includes plenty of action and suspense, riveting the audience to the edge of the seat. In true Spike Lee fashion, much of this exhilaration is created by superb cinematography and editing, demonstrating the confusion of the situation and the clarity of the cause. While the plot takes liberties with the facts, the film is enriched with accurate historical asides about the bloody past of the Klan. Most of this is narrated by Harry Belafonte, 91-year-old singer and civil rights activist, portraying a man who had witnessed the 1916 public lynching of teenage Jesse Washington. That story has lived a century in our national shame. An able cast is headed by John David Washington (yes, he’s Denzel’s son) in the title role and Adam Driver as Flip Zimmerman, Stallworth’s alter ego. The primary antagonist, the unintelligent but clever Felix Kendrickson, is made believable by Jasper Pääkkönen. Ashlie Atkinson does a credible job as his wife Connie, the woman seeking relevance in a man’s world. Perhaps it’s the performance, or perhaps the make-up artist, but Topher Grace is convincing as David Duke. A long epilogue, containing actual news footage of recent hate crimes, underscores the relevance of this well-told story. If I have anything to criticize about the film, it would be the film’s trailer which doesn’t do the movie justice. Bobbie Kirkhart is a past president of the Atheist Alliance International and of Atheists United. She is a founder and past vice president of the Secular Coalition for America. She is a frequent contributor to U.S. freethought publications.